Paint balling is the perfect event for anyone looking to experience a fun and unique adrenaline rush. 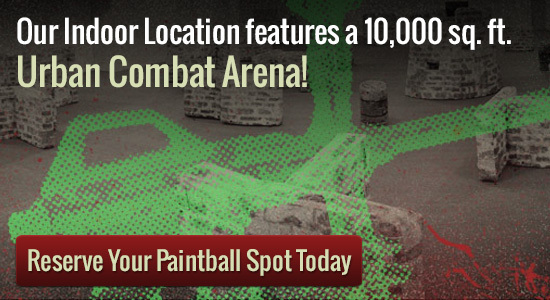 Splatball is the absolute highest quality paint balling experience offered in the Minneapolis area. At Splatball the clean and very high quality facilities include, a paved parking lot, indoor restrooms, and a spectator area for family and friends who just want to watch the action unfold before them. The paint within the balls is a non-discoloration color which will not damage you (as long as you and your party refer to the instructions). Although the paint is non-staining we do not recommend bringing your best suits or dresses because there is still the very high possibility of getting dirt and mud on your clothing, so please dress appropriate. At Splatball you have the option of purchasing a coverall suit which is a suit that covers just about your entire body or you can add a battle vest; both will do an adequate job if you are looking for that extra bit of protection. Playing requires practically nothing additional of yourself besides showing up. You don’t have to take your very own weapon or know anything at all about paintball; the experienced staff will teach and assist you all that you should know before playing. Groups of any size can reserve a paintball party at Splatball. Our Minneapolis indoor place is incorporated in the coronary heart in the Dual Metropolitan areas. It features a ten thousand sq. ft. urban combat industry and also the greatest retail store/technology center in Minnesota. The entire service is weather controlled for maximum convenience. We even have an observation area and exclusive get together space. There is no minimum number of players required to reserve a game at Splatball. Walk-on sessions are also available for individuals or smaller groups that would like to play paintball with players of similar experience. Please call us at 612-378-0385 if you have any questions or if you would like to reserve a time. Please call ahead in advance as reservations are required.